Hi all, in this article I will describe you how to use excel files in your test automation projects for data driven testing. We can do data driven testing in several ways. We can use TestNG data provider for small data sets such as 3-4 different login data or if we have more data we can choose to use excel files or we can store the test data in a database. In this article, I will explain how to use excel files to store all test-related data. In order to manipulate excel files, I mean read the excel file and write to an excel file, we can use Apache POI API. 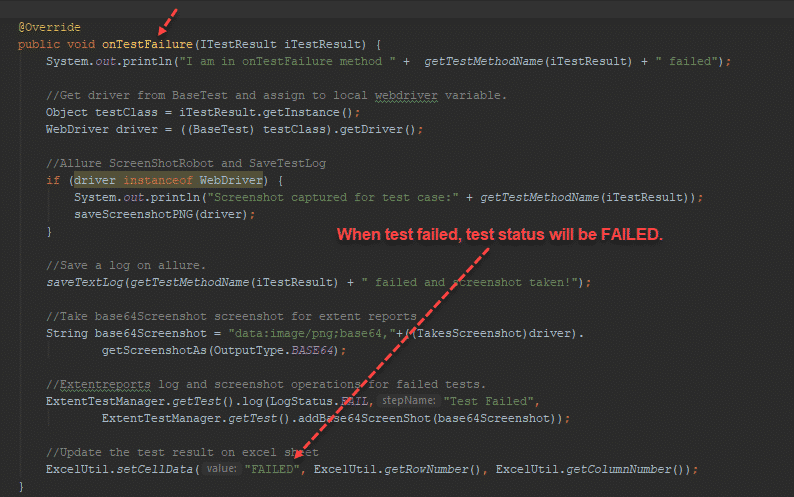 I will show you how to integrate POI libraries into our test project. I will go on with our Allure reporting example, it comprises of Page Object Model (POM) pattern, ExtentReports Reporting, and Allure Reporting features and we will add excel manipulation capability in that project. In order to do that, I will add an ExcelUtil class and this class does all kinds of excel operations. Here is the final snapshot of our project. In order to use Apache POI libraries in your project, you should add required dependencies into your pom.xml as shown below. In order to manipulate excel files and do excel operations, we should create an excel file and called it “ExcelUtil” under excelutils package as shown below. In this file, I wrote all excel operation methods. setExcelFileSheet: This method has two parameters: “Test data excel file name” and “Excel sheet name“. It creates FileInputStream and set excel file and excel sheet to excelWBook and excelWSheet variables. getCellData: This method reads the test data from the Excel cell. We are passing row number and column number as parameters. getRowData: This method takes row number as a parameter and returns the data of the given row number. setCellData: This method gets excel file, row, and column number and set a value to that cell. and I have setters and getters for rows and columns. I will use all of the methods in test classes. * Created by obaskirt on 28-Oct-17. // This method has two parameters: "Test data excel file name" and "Excel sheet name"
// It creates FileInputStream and set excel file and excel sheet to excelWBook and excelWSheet variables. //This method reads the test data from the Excel cell. //We are passing row number and column number as parameters. //This method takes row number as a parameter and returns the data of given row number. //This method gets excel file, row and column number and set a value to the that cell. 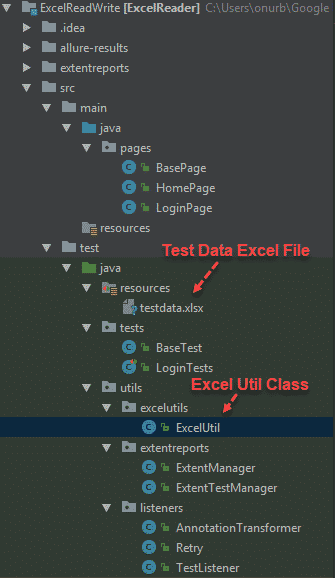 I should also add testDataExcelFileName in BaseTest class because all tests use the same excel file but their sheets are different. We need to set the excel file and sheet name before starting the tests. We have to do it in related test class because each test class has different test data and their sheets in the global test data excel are different too. All lists values in excel file start from “0”. Thus, I have to use “1” for to get first test’s data. Now, it is time to change “loginToN11” method in LoginPage class. row.getCell(1).toString(): This equals to username value. row.getCell(2).toString(): This equals to password value. Here, getCellData method gets row number as 1, and column number as 4 because 4th column holds expected password error message. When we go to the verifyLoginPassword method’s implementation, we will see that it gets expectedPasswordMessage as a parameter and verify it with the actual value. If any of the tests failed, we will see the status of the failed test as FAILED. You can find the sample data driven testing with excel, apache poi, and selenium webdriver project code on our GitHub page. All the best! Thanks for reading! I love you guys! Happy testing. I believe that knowledge will make us modest, instead of arrogant! Ekran görüntüsünü nasıl aldınız acaba ben alamıyorum..
Öncelikle proje cok güzel olmuş elinize sağlık. Bu projede sadece test annotation yazan methodların hepsi çalışıyor senaryoya ayıramadım. Ben excelden inputları alıp adım adım test koşmak istiyorum. Örneğin 3 tane senaryom olacak ilk senaryom sadece n11 sitesini acacak,2.senaryom login olcak,3. senaryom sepete birşey ekleyecek.. Ben sadece n11 sitesini açan senaryoyu koşmak istediğimde diğer 2 senaryoyu çalıştırmayacak..Bu çalıştırılan senaryonun sonucunu extendReport ta gosterecek..Bunu yapmak için nasıl bir yol izlemeliyim. http://toolsqa.com/selenium-webdriver/keyword-driven-framework/introduction/ bu makale serisine bakarak yapabilirsiniz. I will update the code and let u know the results. It seems it is a configurational problem. Maybe u could not get the maven repositories properly. I have just updated the code with the latest libraries. It ran on MAC flawlessly. I hope it will run on your machine too. If not, please check your security settings and try to get the required dependencies. Your problem is a configurational problem. You could not download all dependencies properly as I understood.